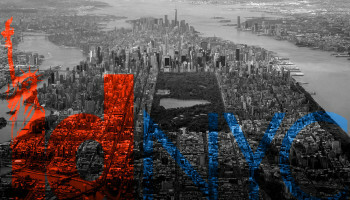 Over the past decade, governments around the world have taken a growing interest in design as a methodology for connecting service delivery to real citizen needs. 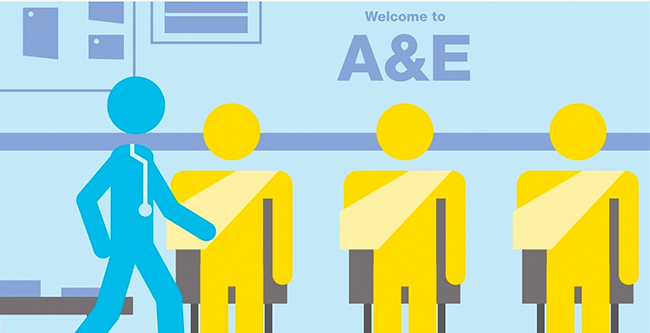 In the UK alone, a surge of design work has fueled frontline service innovations ranging from social care to housing services, in an effort to improve the implementation of policies at the local level. There is now a whole ecology of charities, social enterprises, businesses and interdisciplinary government bodies that deliver design work for the UK public sector. Yet most of the work to date has focused on policy implementation. Camilla Buchanan, a Policy Advisor for the UK Design Council shares recent work to integrate design methods at the front end of the policymaking cycle. She explains how the UK Design Council aids policymakers in the use of design for policy development and why a comprehensive design approach helps to build successful policies that more effectively serve the public interest. She concludes with recommendations to expand the transformational impact of this nascent field. Design has established itself as a field beyond the production of tangible outputs. It is recognized for its strategic value as a process of inquiry or problem solving, and for its potential to spark innovation – particularly in collaboration with customers and citizens – by drawing heavily upon their insights in the development of optimal products, services or systems. Over the last decade, the UK public sector has adopted this new design approach to re-think the delivery of its public services. The majority of design work in the UK public sector had, until recently, taken place in contexts where citizens interact directly with government – particularly in healthcare – where the leap from product design to service innovation is perhaps easier to imagine and communicate. Yet this is changing. While service level work provides clear outputs, focusing on the design of frontline service projects alone risks failing to address hidden challenges within the system and the deeper policy context behind the services. This has led to a growing interest from the UK central government in the potential for design at the front end of the policymaking cycle. The major driver for this is the Civil Service Reform Plan (2012) developed by the Cabinet Office. The plan aims to tie policy decisions more closely to implementation and to bring outside expertise into the UK Civil Service. 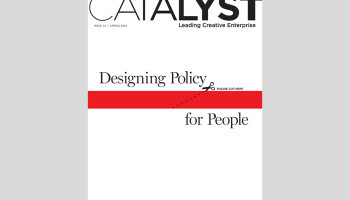 As a result, the Cabinet Office established a Policy Lab in April 2014 specifically to work with central government departments on policy challenges using design. UK Design Council has also played a role in the introduction of design into live policy development through training workshops and more sustained policy development projects. For example, for the past 18 months the UK Design Council has led a complex policy development project with one central UK government department to shape a change in legislation involving complex stakeholder groups. The motive for the partnership was to improve transparency and clarity in the legislation for external stakeholders and to reduce the departmental bureaucracy involved in its delivery. The policy team sought to focus on in depth stakeholder consultation and facilitation at the early stages of the project in order to more effectively design the legislation around diverse interest groups. Policymakers often signal that the current policy-making process lacks an understanding of the needs of stakeholders who will be most affected by the policy. Design methods help to reframe problems or challenges to get to the root of those needs. In the legislation project above, UK Design Council led in depth face-to-face stakeholder interviews and workshops to gather observations of user experiences interacting with the legislation. This helped generate ideas for changes to the legislation as well as more effective ways for stakeholders to navigate it. By involving stakeholder groups more closely than in a traditional text-based consultation, the policy team surfaced much richer human insights around user perspectives, and increased trust amongst stakeholders. 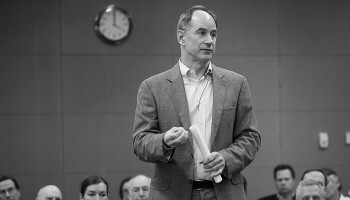 Bringing knowledge together from different disciplines and sectors can be challenging, particularly given the scale and complexity of bureaucratic structures in government. To circumvent this, UK Design Council forms internal teams comprising of people from different staff levels and disciplines when addressing policy challenges. The legislation project above worked with an interdisciplinary group to create an ‘experience map’ showing the process of external stakeholders and government officials when interacting with the legislation. 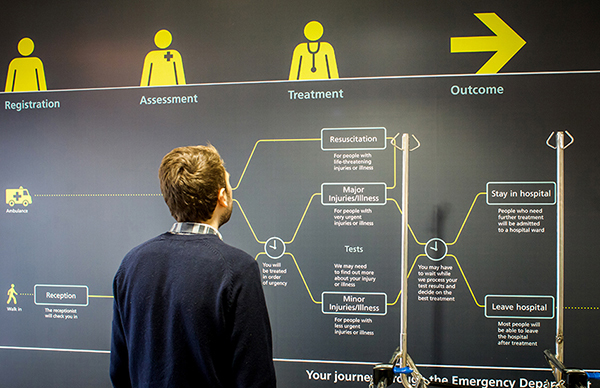 This was the first time where all elements of the process had been mapped out visually from end-to-end, which helped to identify current ‘pain points’ for both staff and external stakeholders. By eroding disciplinary boundaries and collaborating with all stakeholders, the policy team created a common approach and exposed everyone to the views of other groups. Building evidence throughout the policy making process is critical. Continuous ‘prototyping’ is an effective and efficient way to find out what elements work quickly. 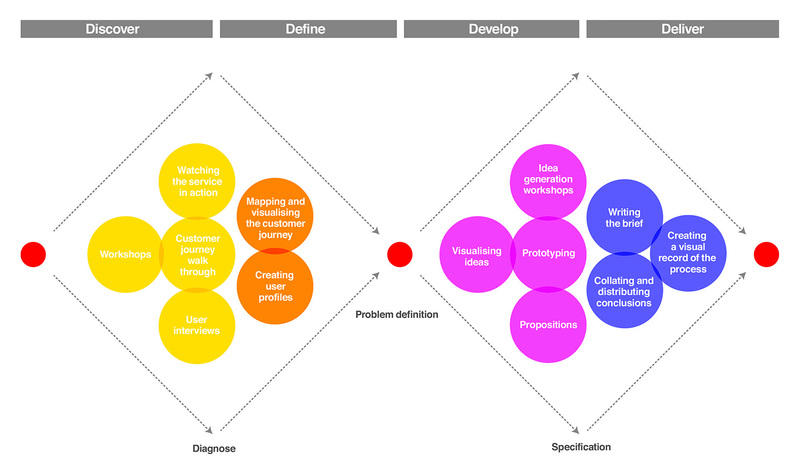 The UK Design Council’s Double Diamond is a simple visual map of the design process. It is divided into four distinct phases – Discover, Define, Develop and Deliver. Reflecting the language and terms used by the policy team in the legislation project was particularly important when presenting opportunities and insights. The policy team for the legislation project felt that bringing together stakeholders in a neutral, non-government space facilitated the workshops’ best results. Much of the design training work in central government has been at the ‘catalytic’ stage, introducing teams to new methods. Deeper training is needed to embed design into more structural government work. As the interest and recognition of design moves up to strategic levels in government, more focus will be needed on integrating evidence of design impact alongside traditional types of evaluation used by policy makers, such as large data sets. In the long term, widespread leadership endorsement is essential for the uptake of design work in policy development. While there are several acceleration and incubation programs for service delivery innovation in local UK government, no equivalent exists in the UK policy development space. Internationally, there are an increasing number of organizations such as Mindlab in Denmark, the Human Experience Lab in Singapore and the new Digital Service in the US government that are working to promote design approaches from within administrations. UK Design Council is also a lead partner on a new pan-European program called Design for Europe, which introduces design skills and examples to policymakers in the EU. There is much work to be done, but early successes from these organizations along with the UK Design Council’s own work suggest the impact on the entire policy cycle can be exponential. Looking forward, the UK Design Council aims to build the UK government’s capacity to leverage design from policy development all the way through to policy implementation. By strengthening this link, governments across the board will be able to unlock more effective policies that serve the public interest, and define a more trust-based relationship between citizens and government to build prosperity for all. Design in policy development enables policy officials to gain a deeper understanding of the needs of stakeholders affected by policies, to build consensus and trust among all stakeholders across the policy process, and to develop simpler policies that drive better outcomes. Camilla Buchanan works in the UK Design Council’s Policy & Research team where she covers business and public sector reform agendas in government. Since 1944, the Design Council has been at the forefront of developing and sharing new thinking on design and running practical programmes that use design to address business and public sector challenges. Camilla works closely with the Design Council’s delivery teams to identify and explain the value of design in a way that is accessible and useful to people in business and government. 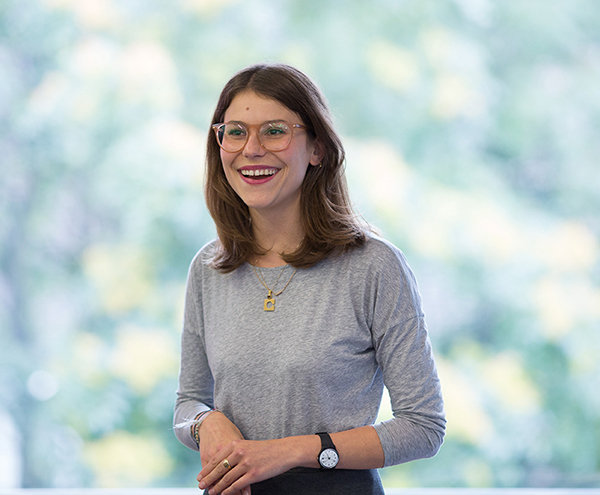 Camilla is also running part of Design for Europe, which is the largest ever pan-European project on design, looking at how design is being used to drive policy, service and strategy innovation in the public and private sectors. Camilla’s background is in public policy and design and includes roles at the British Council and European Commission. Camilla is also a Fellow of the Winston Churchill Memorial Trust and The Public Policy Lab in New York.